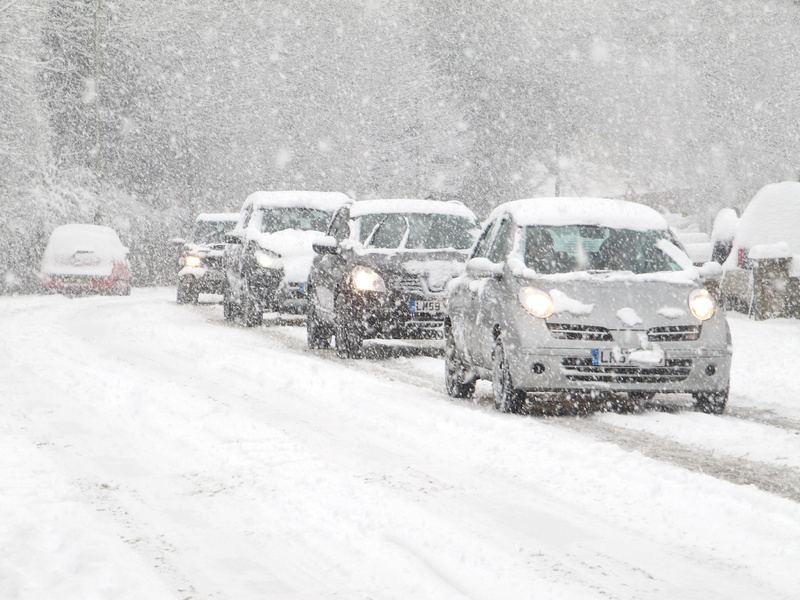 During the colder months of winter, you may have to drive in a snowstorm depending on where you live. Obviously, if you can avoid driving when it’s snowing heavily outside or there’s the potential for ice roads, please do so. However, this is not always possible in every instance. For example, some personnel, like policemen and nurses, are essential to public health and safety and will be required to be at work and patrol the streets even during most inclement weather. In other cases, the winter storm comes as a surprise in which case even emergency personnel may be grounded at their place of employment or at home. A lightning quick snow and ice storm at 2 PM could create havoc by the time it’s rush hour. Make Sure Your Tires Are Inflated: Your tires are more likely to lose air when it gets colder. Deflated tires are not safe for winter weather travel. If you live an area where it snows a lot, you might want to invest in winter tires, which can provide additional protection. Keep Your Gas Tank at least Half Full: Snow and ice not only slow down traffic, but also increase the likelihood of an crash. You could potentially get caught in a traffic jam where you may not have access to a gas station for some time or you may get stuck at home or in your car during a winter storm wherein you cant fill-up. Plus, running on fumes is not good for the vehicle’s longevity in general. Wear Your Seatbelt at all Times: This may be obvious, but it’s worth reiterating. Before you turn the engine on, be sure to click it. Don’t Drive Tired or Distracted: You should be paying attention to the road at all times of year, but it’s especially important in the winter. Quick stops and dry ice are common during the winter months in many states, so you’ll need to keep your focus. If you’re tired or constantly looking down at your phone, you will be less likely to spot those potential hazards. Avoid Using Cruise Control: Again, this goes back to enhancing your ability to make a quick decision. Cruise control is good for a long highway drive in the summer and when few cars are on the road. However, on a potentially icy road, cruise control is a no-no.